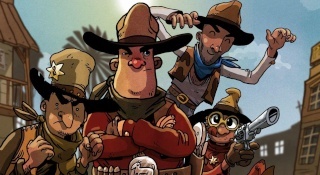 The mobile game market is a place where many cheap and poorly designed games are released and forgotten, however despite its mobile marketplace origins Frederic: Resurrection of Music is a quality title worth taking a look into, but it has its share of issues. But do the positives outweigh the negatives? Keep reading to find out more! Frederic: Resurrection of Music takes cues from the gameplay in games such as Guitar Hero where you must hit the notes that travel down the screen and onto these keys you must hit them when the notes are in the correct position to increase your power and win the duel during the end of the song! The Gamepad plays an integral role in this game, however some of the motion controls are quite sloppy, but overall the controls are quite smooth and easy to learn. The Off-TV play is also a decent feature, however the sound often cuts out during the stages, which is a shame. 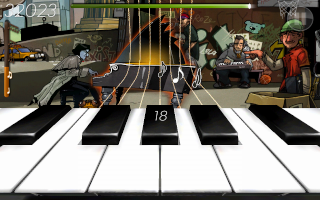 The game features 12 arrangements of Frederic Chopin that are given a modern twist and have been changed to adhere to modern music genre's such as rock, hip-hop, jazz, etc.The gameplay features cutscenes that tell the plot in a amusingly strange comic-style fashion that are quite interesting to watch, but you'll be too busy playing the stages to really enjoy the cutscenes. Stage 8 sadly gave us some serious issues with lag, but the rest of the levels seem to work perfectly so while this issue does affect the overall score we have awarded this game, it's not a game-breaking issue. The graphics in Frederic: Resurrection of Music look colorful and detailed. And the music is very impressive and will draw players into this game's musical world and the sound effects are quite good as well. The only negative is that the sound doesn't always play on the Gamepad, but it's not a game-breaking issue. 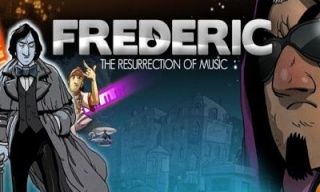 With great gameplay, excellent soundtrack, and impressive graphics Frederic: Resurrection of Music is a superb title that will draw players in with its quirky style of musical gameplay and would be an incredible gem if not for several flaws that the game possesses, however it's still a solid title worth its reasonable price! A 7/10? I wasn't expecting a score that positive! I just might download this game!